As faithful listeners of NPR’s Car Talk well know, anyone looking for a safe ride for their teenager’s first car was almost always pointed towards a used Volvo. They had a great reputation for safety and reliability… and they just looked reassuring sitting there in your driveway. 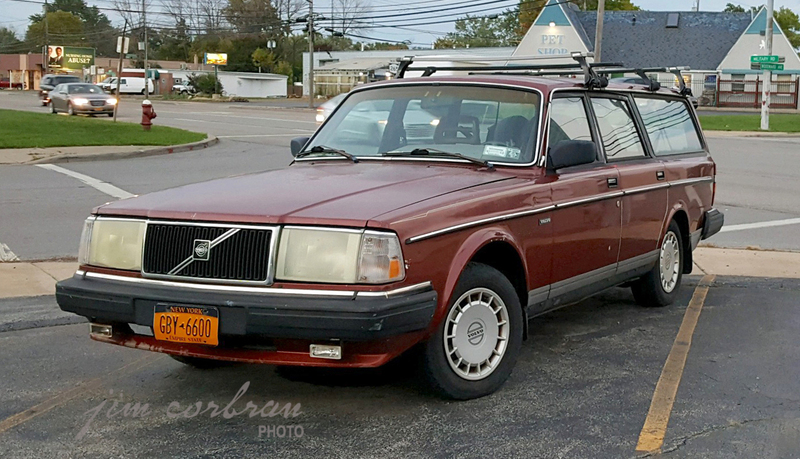 This 1986 Volvo 240DL, seen over the summer in Tonawanda, still looks pretty spiffy. Too bad no one was around, as we would have liked to have found out the mileage. Volvo’s 200 series cars were manufactured from 1974 to 1993. Their middle digit indicated the number of cylinders in the engine, and until 1985 the third digit told you how many doors (the 245 was a four-cylinder station wagon, while the 242 and 244 were two- and four-door sedans, respectively). The 1986 model was the 240’s second major facelift (the first being in 1981). Almost three million 200 series Volvos were produced.